Scripture quotations marked ESV are from The Holy Bible, English Standard Version® (ESV®), copyright © 2001 by Crossway, a publishing ministry of Good News Publishers. Used by permission. All rights reserved. Scripture quotations marked THE VOICE are taken from The Voice™. Copyright © 2008 by Ecclesia Bible Society. Used by permission. All rights reserved. copyright © 1998 by David H. Stern. Published by Jewish New Testament Publications, Inc. www.messianicjewish.net/jntp. Distributed by Messianic Jewish Resources. www.messianicjewish.net. All rights reserved. Used by permission. World English Bible™ quotations are indicated as WEB. Printed locally on recycled paper with soy-based inks at Community Printers, Santa Cruz, CA. It started with a wish. I mentioned my “bucket list” in a sermon — things I’d like to do before I kick the bucket. One of the first things on my list, I revealed, would be to take my wife and youngest son to Israel. Later, a man in our church, Lee Hanson, told me, “You know, René, that’s not exactly the impossible dream!” He volunteered to set up a tour for me to lead. And the idea caught fire. Dave Hicks, one of our pastors, suggested I turn the trip into a book. And you hold in your hands the fruit of that journey. We ended up visiting both Israel and Jordan, and I’m so thankful to Lee, Dave, and Gina Weeks, who administered all the trip details. Invaluable to our experience: Our charismatic, brilliant guide, Kenny Garon, from whom I learned so much. And obviously we could not have seen anything without Dov, our amazing bus driver. Kenny, a Jew, and Dov, a Christian, are a wonderful example of the kind of love and camaraderie we all pray to see one day everywhere in the Middle East. Massive thanks to Kelly Welty, who produced all the small group videos and who, along with Philip Lima, beautifully photographed the trip. Thanks to John Eric Paulson for his beautiful photograph on the cover, and to Priscilla Watson for her watercolor maps. Major thanks also to Valerie Webb, who shepherded the whole project, wrote the daily questions, and, with Jim Josselyn, wrote the small group study questions. Thanks also to José Santillán, who spent hundreds of hours translating this book into Spanish (Los Viajes de Jesús). I’m indebted to layout artist extraordinaire Kevin Deutsch and the many, many others at Twin Lakes Church who contributed to the production of the book and editing of the manuscript, especially the talented writer Karen O’Connor, my wife Laurie, the aforementioned Dave and Kelly, Brian King, June Ettinger, Margie Bishop and my friend and co-pastor Mark Spurlock, who all read various drafts and made many valuable suggestions. And I am grateful to every single person who joined us on our Holy Land trip. The ceaseless, genuine brotherly love we experienced gave me a glimpse of life in the Kingdom. I’m particularly happy that my wonderful wife Laurie and awesome son David could join me and make the trip a lasting family memory. Next time I hope my son, Jonathan, and daughter, Elisabeth, can join us as well! 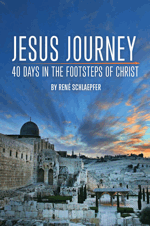 Finally, all praise to Jesus, who joins us all on our journeys, making every land Holy Land.